Based in Chicago, Elisabeth Andersen has been writing since 1990. She authors health-related articles and booklets for various hospitals and clinics, focusing on nutrition, healthy living, and exercise. Andersen is a registered dietitian and certified diabetes educator. She holds a Bachelor of Science in nutritional science from Southern Illinois University. The pineapple originated in Brazil and Paraguay. Native Americans spread it throughout South and Central America to the West Indies before Spanish Conquistador Christopher Columbus carried it to Europe. Comprised of many smaller fruits fused into one, the pineapple is known for its simultaneously tart and sweet flavor. Although the flesh of the pineapple is the part most commonly consumed, the core of the pineapple is also eaten and contains valuable vitamins and nutrients. Removing the green stem from the top of the pineapple is the first step to finding the core. Slicing the brown peel around the entire pineapple is the next step. Slice the whole pineapple into four equal rounds, and look at each section for a circular, small woody center. That's the pineapple core. It's edible, but tougher than the flesh that surrounds it. You can remove the core with an apple corer or a sharp knife. One hundred grams of fresh pineapple provides 86 calories, according to Organic Facts. Fresh pineapple would be considered a high-fiber food. Fiber in the diet is important for a healthy digestive and immune system. The naturally occurring bromelain is a protein enzyme located in the stem, brown peel, flesh and core of the pineapple. There have been numerous university and government studies regarding the health benefits and quantity needed of bromelain to reduce pain and inflammation. 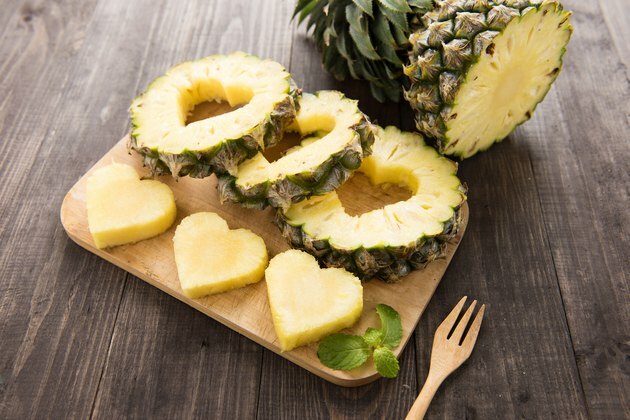 According to one study at The Louisiana State University, when the bromelain content in the pineapple core was measured, researchers found that the core has an even higher level of bromelain than the fruit peel. Pinapple is a rich source of vitamin C, which supports immunity. Additionally, pineapple is an excellent source of manganese, which helps with proper bone formation, and copper The pineapple core is as nutritious as the pineapple flesh, providing numerous essential nutrients.